With work on California’s High-Speed rail about to take off, interest in the trades that the rail will need appears to be increasing. That’s according to groups that run pre-apprenticeship programs that teach people the skills necessary to work on building the train. Talk of the project is driving interest in programs intended to train the men and women that will be needed to build it. One of those programs is the five week high-speed rail pre-apprenticeship run by Chuck Riojas with the union Building Trades. He says talk of the rail has thousands of people applying for his course that teaches a wide range of trade skills needed to construct everything the train needs from the power to rail and support structures like train stations. “Anything that is construction related. 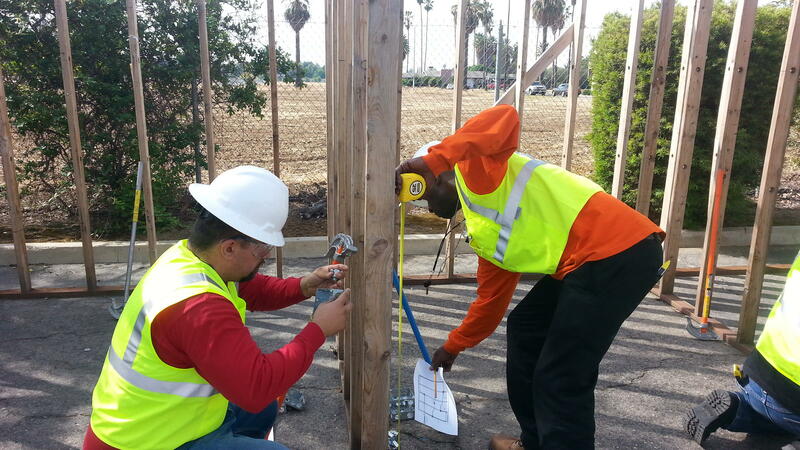 From electricians to sheet metal workers to operating engineers, laborers, carpenter, cement masons. They all have a role,” Riojas said. At their facility in Fresno, an instructor teaches a group of 20 students some basically electrical work. Over the course of the program these students will get a taste of a wide range of trades to see where their skills lie. One of those students is Aaron Fillmore, who used to drive a tractor on a farm until the drought killed his job. He is hoping that learning a trade could provide him more stability. “That is what brought me to the program. I saw the high-speed rail and I thought ‘well there is a lot of jobs there’ it is a big project and I know it last a long time. I thought this was a way to get my foot in the door and hopefully that works out,” Fillmore said. After the five weeks, most if not all of the students will become an apprentice in a craft and hone their skills. Another student, Angela Tyars, a high school basketball coach and warehouse worker, moved to Fresno from Southern California to pursue the apprentice program. “I am learning a lot. And it is interesting. I feel like I can get out there and do almost anything. I feel like if I pay attention, and do the job, and show up on time, it will be alright,” Tyars said. This is the third high-speed rail funded class. Students are not guaranteed a job when they finish. But student Terryll Woods says he is confident he will have a job. “You hear things on the news that it is coming and I would like to be a part of history. (A part of history) Yeah. (so you think this is really going to happen?) Yeah, I really do think so, Woods said. The careers are a big step up for many involved. Some of the higher paying trades can reach salaries of 80-thosand dollars a year. And even though the union’s class sizes have tripled, positions in the pre-apprentice program are still highly competitive. Instructor Chuck Stanton says applicants have to pass a math test and go through a series of interviews before they are allowed in. “Of the people that apply, probably 10-percent get in. So we are looking for the best and the brightest. If you are somebody that has struggled throughout high school or college. Chances are you are not going to make it into the building trades,” Stanton said. The program is free, but it is also full time for the five weeks it is in progress limiting the ability of the students to work outside of their training. But the people in the course say it is a big chance to start a new career that could keep them gainfully employed for years to come.